Photo copyright 2018 Auto Imagery, Inc.
Rick Hord celebrates first win. No. 1 qualifier Rick Hord powered to his first career victory on Sunday during the E3 Spark Plugs NHRA Pro Mod Drag Racing Series presented by J&A Service portion of the NHRA Carolina Nationals presented by WIX Filters at zMAX Dragway. The race, presented by Mr. Race Oil, is the 11th of 12 races during the 2018 Pro Mod season. Hord, who posted the second-quickest pass in the history of the class earlier in the weekend to qualify No. 1, went 5.706 at 257.68 mph in his turbocharged '16 Corvette to knock off Sidnei Frigo in the final round, who slowed to a 5.952 at 253.75 in his '69 Camaro. 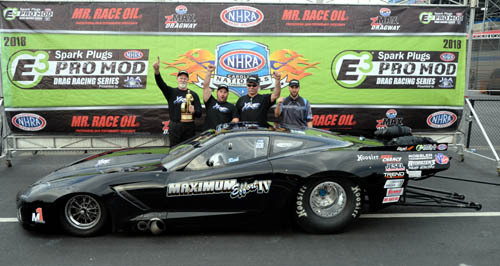 It was Hord's second career final round and he finished off a consistent weekend to pick up his first career E3 Spark Plugs NHRA Pro Mod Drag Racing Series win. "I thought we had a good chance," Hord said. "In Dallas, we had the combination and we broke parts, and we really thought that was going to be our race. Here, we just tried for consistency and that worked real well for us. This is amazing." Hord defeated Bob Rahaim, Justin Bond and Michael Biehle to advance to the final round, setting up Hord's first ever matchup with Frigo in eliminations. In the points race, leader Mike Janis now holds a 24-point lead over Rickie Smith heading into the final event of the year. The E3 Spark Plugs NHRA Pro Mod Drag Racing Series wraps up its 2018 season at the NHRA Toyota Nationals on Oct. 25-28 at The Strip at Las Vegas Motor Speedway.